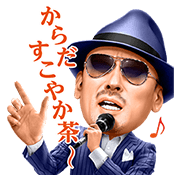 http://www.line-stickers.com/ – Karada Sukoyakacha W Crazy Ken Stickers Line Sticker | Enjoy the melody from the Karada Sukoyakacha W TVCM with a new sticker set featuring Crazy Ken! When you get “Karada Sukoyakacha” stickers, just answer with “Double” stickers! Friend Coca-Cola Japan’s official account to get them. Available till July 4, 2017.